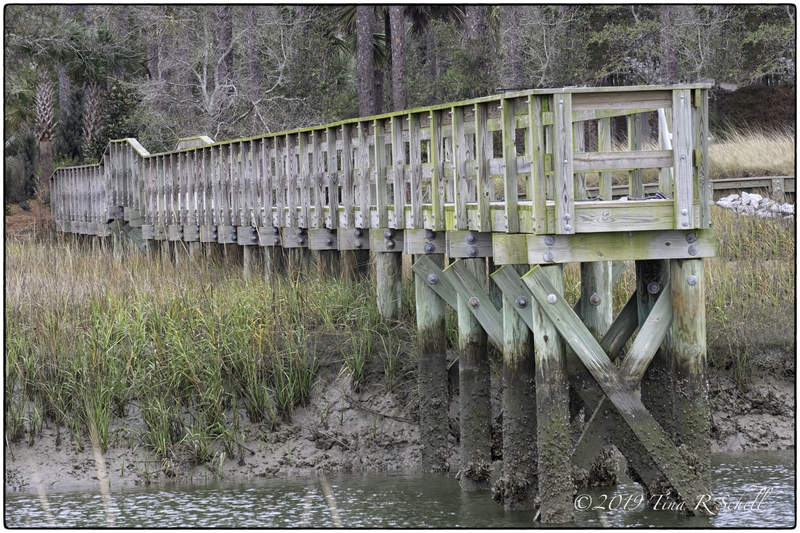 Speaking of oyster shells, you can find them most everywhere in the marshes around Kiawah. They’re an immensely popular local delicacy that I must admit I’ve never quite warmed up to. I do however find them interesting as a subject for my lens – as evidenced by today’s images. 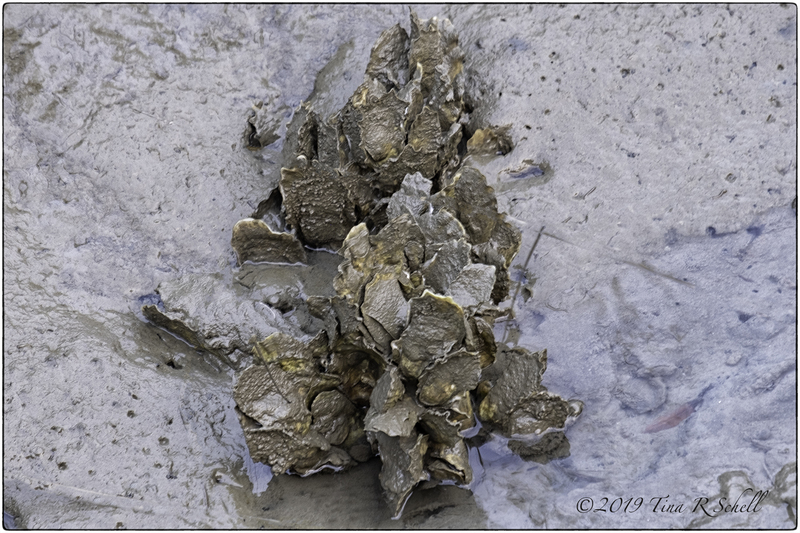 One of the interesting places oyster shells can be found is at the foot of the stanchions that support the many docks lining our marsh creeks. I’m not sure what causes them to attach themselves there, but attach they do. In fact, many southern states now have oyster “farming” projects for waterfront dock owners. Cultivating oysters is good not only for the palate (they are packed with vitamins and minerals) but also for the environment. 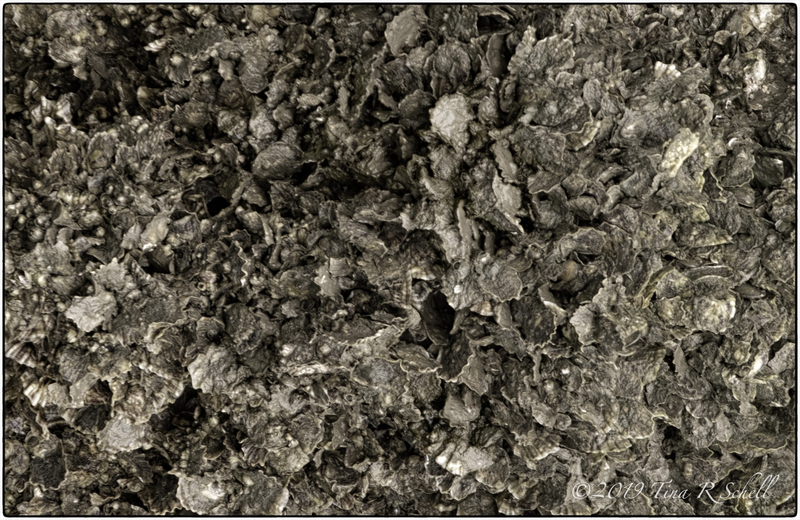 Oysters filter over a gallon of water per hour, mitigating pollutants from the waters and purifying it in more ways than one. Now that you’ve learned more than you ever wanted to know about oysters, we hope you’ve found some interesting subjects for Ann-Christine’s “up close” challenge, and that you’ll join Amy next week for Challenge #35. Remember to tag your post Lens-Artists to increase your visibility to other participants. If you need help learning how to tag, click here. I agree with you Tina. Oyster shells are better enjoyed as art rather than on the plate. Tina, I love the colors in all of your oyster shell shots, especially in Stuck in the Muck! You chose such an interesting subject to highlight. Thanks Sylvia, glad you enjoyed this one. A seashell tree – I LOVE that idea Jo! If only…. Really like the texture and color of that dock! Interesting photos, Tina.. The first one is my favorite. I just wonder how the shell could hang on the trunk like that.. I haven’t developed the taste for oysters either … maybe it’s eating them raw, which many favor. George, Andrea’s dad, said you can cook oysters, but they’re easy to over cook, and that’s when they become more like shoe leather. Science projects are about as close as I plan to get to an oyster David 🙂 Thanks for stopping by! We have several on staff here at Kiawah – a great idea! I have never taken to eaten raw oysters (tried once and was almost sick – it was like the texture of a raw egg, but salty!) but I have eaten them baked with spinach and Parmesan cheese in California and Canada and they were very nice. An interesting and informative post Tina. Thanks Jude. My view of them is a bit more gross so I’ll keep it to myself. But I do agree an Oyster Rockefeller can be yummy! Thanks Xenia – it was such a curious find! Nature does surprise, and you spied a perfect example: the sea shell image captivates. Thank you Sally, it was a fun find. I stared at that oyster shell, too, and could not imagine its voyage to that tree branch! 😀 One of nature’s mysteries! It’s not a stew filled with veggies and things. As I recall, it was oysters and potatoes in a cream-type base. Quite tasty! Beautiful collection of photos. The water seems to rise and fall by a couple of feet, to judge by that last photo. Was it winds of a bird which stranded that oyster so far up a tree? Loved that quote – so very true. Love your take on this too – the oyster in the tree branch? I think that tells us a great deal about life! I loved that one too A-C. As for the oyster, it may tell us a great deal but we can’t know what LOL! Maybe simply to expect the unexpected! I like the dock shot best 🙂 Oysters are fascinating, but I don’t get why you’d eat something that filters pollutants! My sentiments exactly Gilly, but they are a VERY popular delicacy around here!! A bit like eating kidneys! Thanks Svetlana. I really liked the opening shot so the story kind of naturally followed. 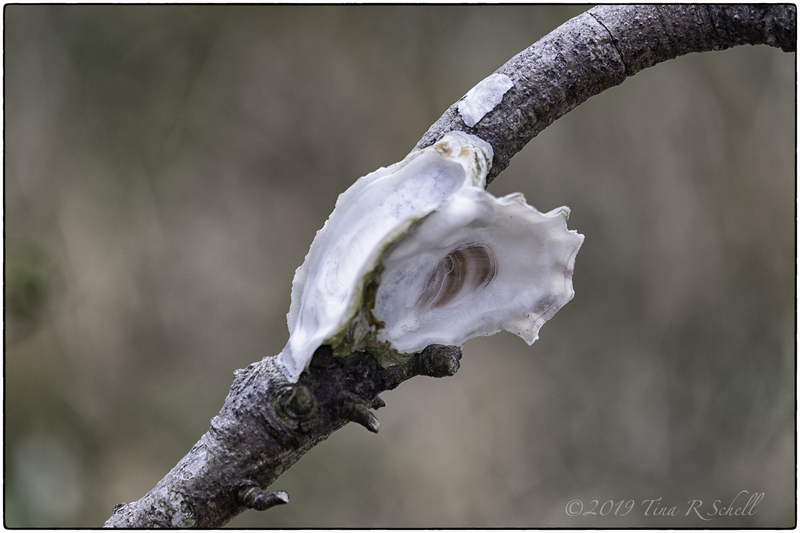 Oyster shell on the tree branch…really special! Thanks Laurel – weird isn’t it?! LOL, let’s hope not. I wouldn’t want to have been the kid who rode it there!!! Always love the subject of oysters as they give birth after an arduous process of irritants entering their domain to form a pearl! I love that oyster randomly attaching to the vine…. Thanks Linda – that one was what drove me to do the post. Glad it caught your eye! Beautiful close-ups, Tina and love your seashell theme! Thanks Terri, the post rather wrote itself after I chose the first photo. I love learning new things–and your images and quotes are always so engaging. Thanks. Thanks Patti – I wholeheartedly agree – it’s nice to find something you didn’t know when reading posts. Glad you enjoyed this one. They say oysters are aphrodisiac. I don’t know if this is true maybe It must be the pearls. Yah, why do they attach themselves on almost anything. I like the first shot, Tina. Thanks Perpetua. As for their aphrodisiac quality, I will never know as I don’t plan ever to eat one!! Thanks BB, my first ever as well! Thanks Amy – actually I didn’t know either until I started putting this post together. That first shot of the shell on the tree is a great excuse for a whole post about oysters 🙂 Also love the pier. lol 😉 i love those kinds of shots. Thanks Sue. Love is not a word I’d use in a sentence with oysters!! Amazing where oysters attach themselves. An interesting wintry series around the oyster beds, Tina. That last shot makes my eyes vibrate. Fantastic collection of close ups and details. How did that oyster get embedded in a tree branch?? Amazing capture, Tina! That’s the $24,000 question Patti!!! I don’t eat oysters, but this post makes them quite interesting to know about, especially that they are good water filters! LOL Priscilla, I know those who eat them really love them. I just can’t get past what they look like!! Oh, Tina–you asked the very question I had: How did that oyster wind up in the tree? We have had several oyster farms here in the Gulf, but they were very damaged from the storms we had. From what I have read in our local newspaper, there was a lot of money lost in the farms. Slowly, they are coming back. This was a wonderful post. Thanks Lois – interesting that the storms had such an affect. The docks here are also among the first to be impacted so I’m sure the storms caught us too. Thanks for stopping by!